Got this idea from Dawn. You can see her version here..
Back black piece is 4 1/4 x 5 1/2 . I made a normal card and then cut it so that the card is smaller and there was room for the lolli pop. I stamped the spiders and the Trick or Treat saying. The mummy is from paper doll dress up cartridge. Thanks for looking! Here are a couple pictures from a craft fair I did this past weekend. Popular items were Pumpkin Poop and Post It Note Holders. Thanks for looking. 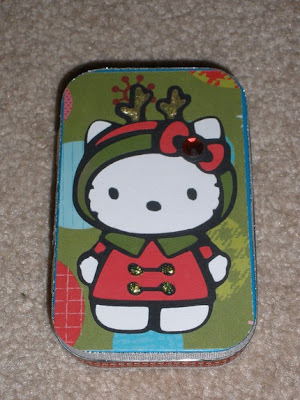 My first Hello Kitty altoid tin. 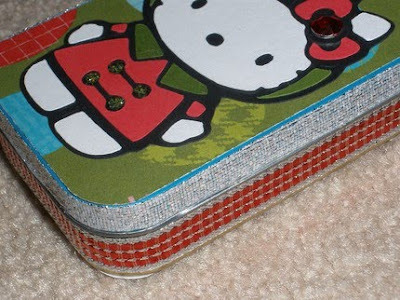 I love altering these altoid tins and decided to play with my hello kitty cartridge. Thanks for looking! Glued ribbon to the sides. I lined the interior and the back as well. I just opened my Etsy store! I only had time to put 5 cards on their last night. Check out my store and let me know what you think. Hopefully this weekend I will spend alot of time adding more items. Thanks for looking! I altered this starbucks jar for some craft fairs coming up. One down.. 24 more to go! I was able to fit 10 pieces of candy inside. The witch was from A Childs Year cartridge. I embossed it with my cuttlebug. I made the pumpkin on top by following happileighscrappin's tutorial on her blog (link below). I didn't have an oval scallop pumch though so I used my circle scallop punch. Turned out ok I think. I used pipe cleaner for the stem and martha stewart branch punch for the leafy stuff. I bought a bunch of mailboxes at Target in the spring and have been saving them. I finally busted them out tonight and decided to play with my Hello Kitty cartridge. I love Hello Kitty. This is what I came up with. Thanks for looking! 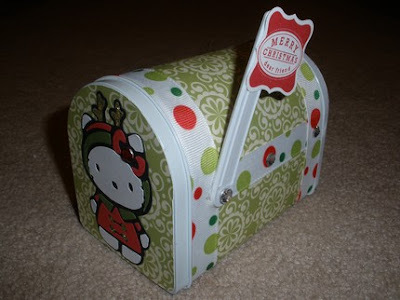 Just got my A Childs Year cricut cartridge from Oh My Crafts! I love this card. The sentiment says "Chase Your Dreams You Might Catch One". Its from a clear stamp set I got at Joanns. I cut the girl in black, the shadow in pink and then cut the girl again in a pink and orange stripe paper so I could use it for the kite. Thanks for looking! Here is a close up of the sign.. I've been on a roll lately with cards! I usually make more 3d items then just cards. I found the idea for this card on the cricut message board. I can't remember who's idea it was and I can no longer find the post :( Anyways whoever it was THANK YOU! I think it is such a cute idea! The strawberrys are from Indie Art and then I used the cuttlebug for their wedding outfits. I used Storybook cart for the scallop circle and the circle branch frame for this card. The butterflys are a martha stewart punch. I used the watermellon from Doodlecharms on this card. This card I used storybook for both the frame and "birthday girl"
I made this card using 3 cartridges. I cut out the tree from Stretch Your Imagination. I then cut off all the leaves. I cut out the heart from George and Basic Shapes and cut out the birds from Joys of the Season. I then pop dotted the whole tree. 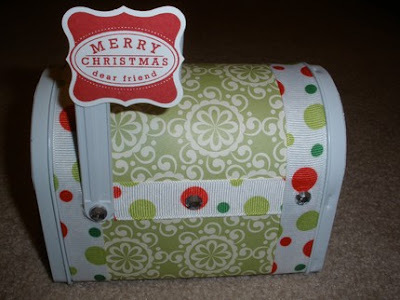 The saying is individual letter stamps that I colored in and stickled. Thanks for looking. I used a 1 3/4 inch circl punch to create the neck, sides and the bikini bottom leg spots. 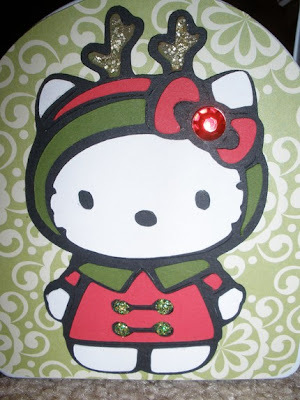 This card I used Joys of the Season. I cut the reindeer at 3 1/2 inches. I used DCWV Luxury stack paper. I also used Joys of the season and DCWV luxurk stack on this card. I cut one of the trees out in blackout and then cut out 16 1 inch snowflakes which I layered on top of the tree. 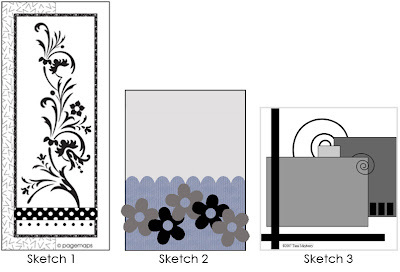 Okie's 9/2 card challenge.. here are the sketches. I decided to do sketch #2. And here is my card. The hearts are from the doodlecharms cartridge. Thanks for looking! I saw this idea on the bind it all blog and just had to try it out. I used an 8x8 zutter chipboard as the backing. Covered it in paper and then cut out things from my cricut. I then punched the holes at the bottom with my bind it all and put the coils through without tightening them. 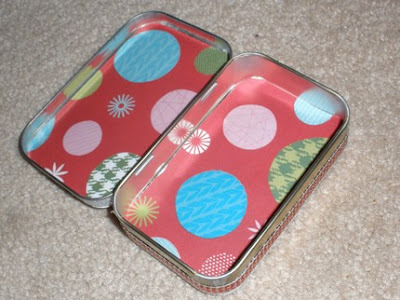 I then punched two holes in the top and ran my ribbon through them. The bird is from Home Accents, the key is from Indie Art and the font is All Mixed Up. Thanks for looking!